1. 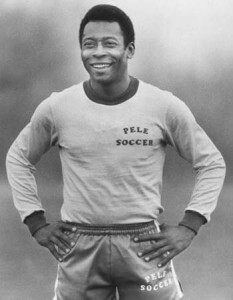 Pele: In our Top 10 List of all time great footballers we keep Pele in the 1st position. He is the most prestigious footballer in the world. This living legend of football was born in Brazil in 1940. He plays a vital role to win first two world cups among three. His finest time comes in 1970. There is no drought that pele is the best footballer of the world ever. In 1975 he joined with NASL and become an ambassador of football in America. His deft touch, dribbling skills is mind blowing. Still he plays a vital role in football officially. 2. Johan Cruyff: In our Top 10 List we select the name of Johan Cruyff in the second position. He wad born in 1947 in Netherland. This Dutch footballer das made the football more glorious. In the age of seventeen he made the hat trick in the European cup football. He selected for the best footballer in Europe for three times. His super dribbling and free kick made him greater in football. He is also a super couch of football. 3. Diego Maradona: In the Top 10 List of all time great footballers we keep the name of Diego Maradona in the third position. He wad born in 1960 in Argentina. He makes the Argentina glorious by his magical football. Is one goal is called the hand of god. He played for Argentina from 1976 to 1997. In 1986 when the Argentina gained the world cup title then he was the main creator of this achievement. This golden boy of football Diego Maradona is rejected by the FIFA for his drug addiction. 4. Alfredo di Stefano: In the Top 10 List of all time great footballers we should keep the name of Alfredo di Stefano in the 4th place. He is the best club footballer. He wad born in 1926. He achieved the title of player of the European football for two times. Di Stéfano was played for Huracán, Millonarios Bogota River Plate. These are the best club on his time. He also played for FC Barcelona. He retired at the age of 40. 6. Franz Beckenbauer: In our Top 10 List we keep the name of Franz Beckenbauer in the 6th position. He was born in 1945 in West Germany. He is regarded the best footballer of German football ever. The nick name of Franz Beckenbauer is der Kaiser’. He started his football international in the age of Seventeen. He was also the captain of his team in 1974 world cup. He is a dynamic player of world football. He was famous for his passing technique and single- handedly control. 7. Michel Platini: In our Top 10 List of the all time great footballer we keep the name of Michel Platini in the 7th position. He gained the title of European footballer of the year for three times. Michel Platini was born in 1955 in France. He was the player of Juventus. He played 147 league matches for Juventus from 1973 to 1987. He has scored 68 goals in his total matches. This Juventus midfildre was famous for his free kick. 8. Eugenio: In our Top 10 List of all time great footballers we put the mane of Eugenio in the 8th position. He was born in Mozambique in 1942. He was famous for his quick dribbling and powerful footed strict. He scored 727 goals in 715 matches. He was played for the club Benefice, from 1958 to 1978. He also played in 1966 world cup. He is all time leading scored of Portugal league. He gained the footballer of the yea in 1965. 9. George Best: In our Top 10 List of all time great footballers we should put the name of George Best in the 9th position. He was born in 1946 in England. He played for the club Manchester United. He was debated by his gambling, womanizing and drinking problem. In 1974 he left Manchester United. His career was rocking at the age of 27. He was the great defender of his time. He gained the title of European footballer of the year in 1968. 10. Zinedine Zidane: In our Top 10 List of all time great footballers we must keep the name of Zinedine Zidane in the 10 position. He was born in 1972. He led France to win 1998 world cup and European championship in 2000. In 2006 world cup he bought the France into the final and he also gained the golden ball. The gained the title of FEFA footballer of the year for three times. His outstanding playmaker was played for the Spanish giant Real Madrid.